In 1985 Mark Hofmann’s last bomb blew himself up with his own pipe bomb. Shannon Flynn, a good friend of Mark Hofmann describes what bystanders did to save Hofmann’s life. It’s a pretty interesting story. When Mark had been blown up, he was lying in the street, and I’ll give another little strange [story.] This whole thing is just too weird. There were some people in the area that saw that happen. Several of them ran over to him. There was a fellow by the last name of Christensen who saw that and went over. Mark’s shirt was torn a bit and he could see garments, so he knew that guy [Mark] was a member [of the LDS Church], pulled out a little vial of oil and gave him a blessing that he would live. Well he did live. I’ll let you all think about that one. What do you think about blessing a criminal to live? Did God honor that blessing? 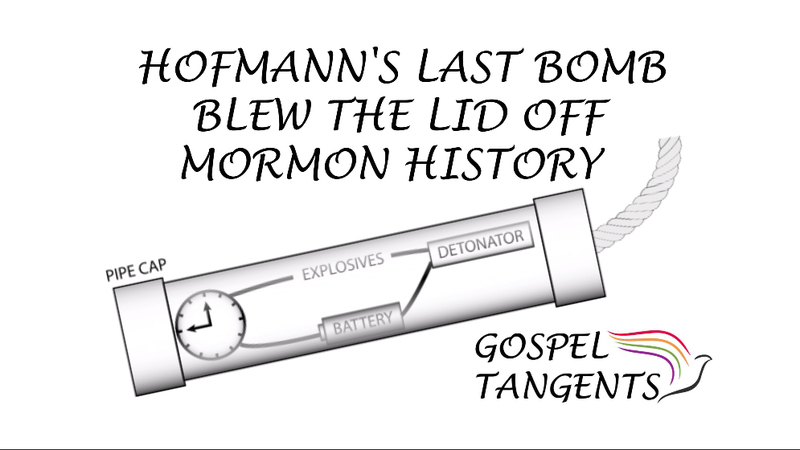 But that bomb didn’t just severely injure Hofmann, it blew the lid off Mormon history. We’ll talk about the Salamander Letter and the magical world view, and how that really changed things for Mormon history. As an example, the Salamander letter, people said that’s going to ruin the church. That completely goes against the standard history of the church. It did go against the basic juvenile understanding that most members have of the church, but that particular concept of salamander or toad, he actually took from Mormonism Unvailed. The concept of Joseph being prevented by that, he took it from a Jesse Knight diary. At the end of the day, it was new information, more, but down the same track. It would not, and in fact it has been proved, I mean it isn’t a real letter, but I mean my heavens, Michael Quinn some years later with Mormonism and the Magic World View, he confirmed every bit of it, every bit of it; not the particular animal, but confirmed every bit of it. 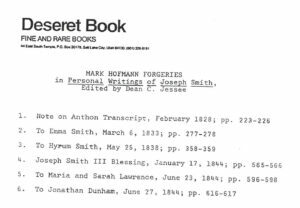 in 1986 or 1987, Curt Bench put together this Errata for Dean Jesse’s book The Personal Writings of Joseph Smith to alert readers to 6 Hofmann forgeries. The 2nd edition, published in 2002 has these forgeries removed. What are your thoughts regarding Hofmann’s forgeries? Are you surprised that Quinn’s book still contained the forgery as late as 1994? What do you think God’s reaction was to the blessing Hofmann received?